If you are a Brewers fan, you already know that Jonathan Villar led the majors last season with 62 stolen bases and that Chris Carter tied for the National League home run title with 41 homers. But what you may not know is that these (now-former) Brewers teammates in 2016 became the fifth set of MLB teammates to have a 60-40 season… one player with 60 or more steals and a teammate with 40 or more HRs. 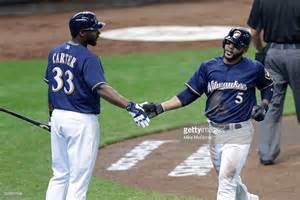 Milwaukee Brewers, 2016: Chris Carter, 41 HRs, Jonathan Villar, 62 stolen bases. New York Mets, 2006: Carlos Beltran, 41 HRs, Jose Reyes, 64 stolen bases. New York Mets, 1999: Mike Piazza, 40 HRs, Roger Cedeno, 66 stolen bases. Cleveland Indians, 1996: Albert Belle, 48 HRs, Kenny Lofton, 75 stolen bases. New York Yankees, 1931: Babe Ruth and Lou Gehrig, 46 HRs each, Ben Chapman, 61 stolen bases. The combined stats of HRs and stolen bases has always been a way to evaluate those players who have that rare, much-desired combination of speed and power. The most common stat has been the “30-30” players, those who get 30 or more HRs and 30 or more steals in the same season. The Brewers franchise has had two 30-30 players in its history: Ryan Braun has done it twice (in 2011 and 2012), and Tommy Harper did it in 1970. In fact, Braun and Mike Trout are the last two players to have a 30-30 season, both accomplishing this feat in 2012. Braun is one of 13 MLB players in history to have two or more 30-30 seasons… father and son Barry and Bobby Bonds top this list, each with five 30-30 seasons in their careers.